Immediately after riders enter the attraction through two sets of bang doors, they begin trekking up Tracy’s famous Crooked Corridor. 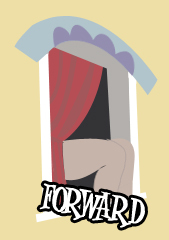 As seen in many dark ride and fun house attractions of the 1960s, the placement of the two-dimensional plywood cutouts and the corresponding application on the bang doors offers a creepy optical illusion. The right-side tire track is elevated to make the car lean to the left, always bewildering first-time riders. The color of the timbers was changed from orange to green a few years back. According to Manfred Bass, a designer and sculptor who worked for Tracy in the early 1960s, Tracy used simpler designs and two-dimensional concepts in the later part of his career because of inflated shipping costs. 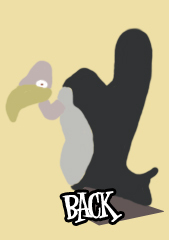 In the early years, Tracy was able to develop three-dimensional characters and ship them all over the East Coast without it affecting his profits. But as the 1970s came into view, shipping became so expensive that Tracy often used his own truck to transport stunts, or he would build them on location using supplies from the local lumber yard. 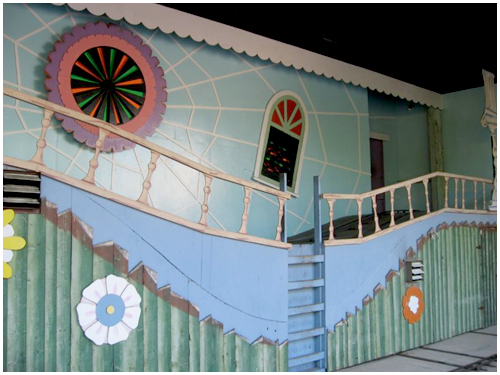 This is in part why Whacky Shack contains simpler illusion-based concepts as opposed to larger stunts like the Torture Chamber, Knit Wit, and Old Mill. Next up is another Tracy favorite; the Revolving Barrel. 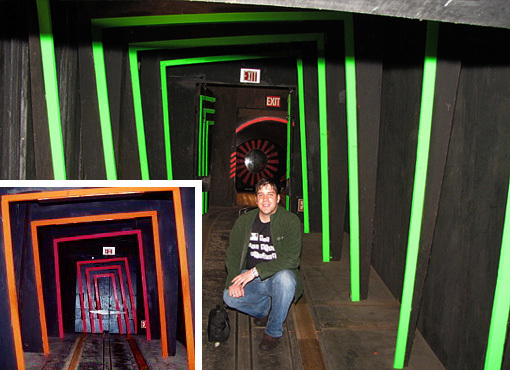 The fiberglass barrel painted with fluorescent orange paint to mimic rock patterns was manufactured by Philadelphia Toboggan Co. and is an original feature of the ride. 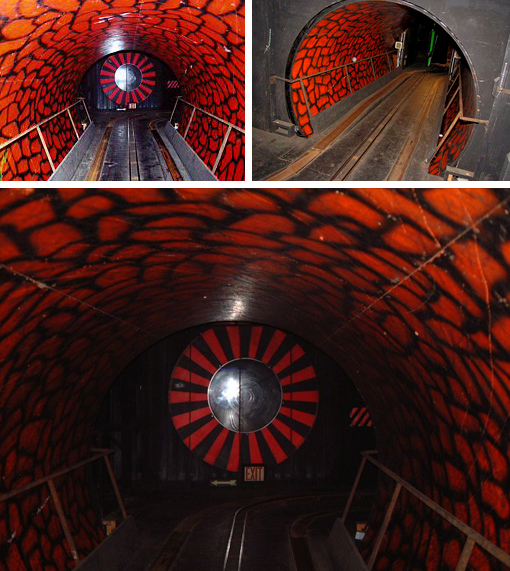 Like the Crooked Corridor, the left side tire track is elevated to make the car lean to the right, and the revolving disc at the tunnel’s end includes a large mirror so riders can watch themselves turn “inside-out.” According to Perry Duncan, despite Bill Tracy’s original assumption that the Revolving Barrel would fit into the ride as one piece during its installation, crews were forced to cut it in half to get it inside the ride after they realized his assumption was wrong because of its massive size. 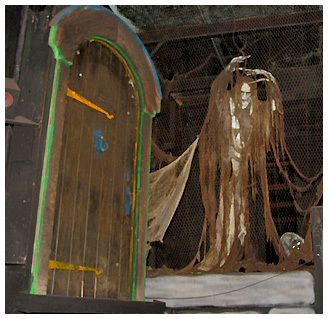 As riders turn right out of the Revolving Barrel, they are face-to-face with two non-original additions to the ride; an old ornate door and "The Apparition." The old door was originally part of the estate of Mr. Nelson’s mother who lived on the park’s grounds just west of Rainbow Gardens and the picnic pavilion. Prior to when the building was razed, Mr. Nelson salvaged the door and figured it would be an interesting addition to the ride. 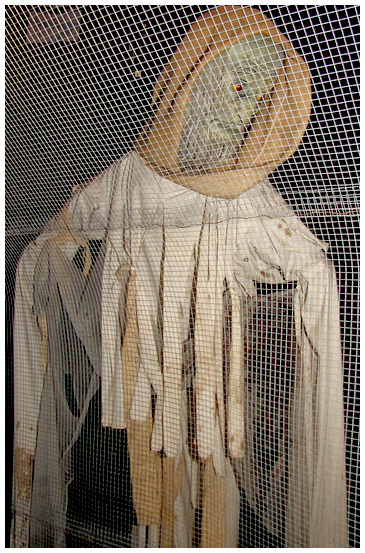 "The Apparition" was added in the 1980s. Riders then continue up “Rat Attic” and are faced with numerous Tracy classics. A series of timbers are placed up an incline while oversized rats sit on top waiting for riders to pass. 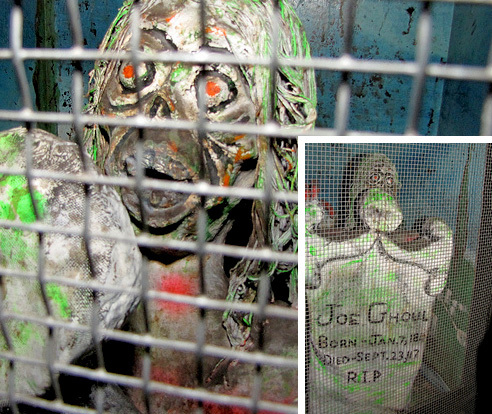 The rats were built by Tracy using sculpted foam covered with fiberglass. If riders are lucky enough, they’ll look to the right to see Tracy’s dead bodies strapped to the outside of the Revolving Barrel and a corpse’s severed head! Near the end of the Rat Attic corridor, riders focus their attention to the left as Tracy’s Ghoul pops up from behind an old tombstone. Straight ahead are three oscillating Skull Spiders. The mold used for these skulls is similar to many of Tracy’s skull molds during the late 1960s and early 1970s. 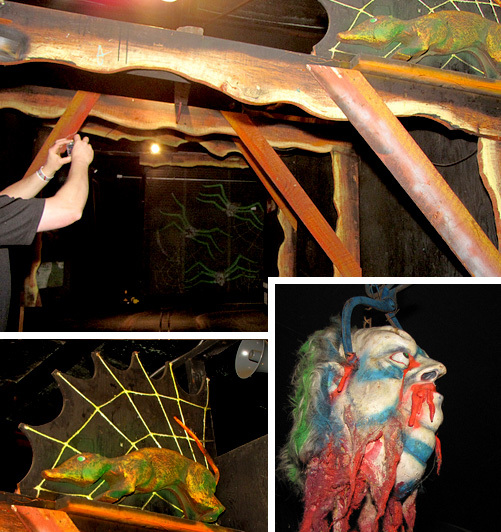 Pieces of rope are strategically placed behind the stunts in the form of spider webs. 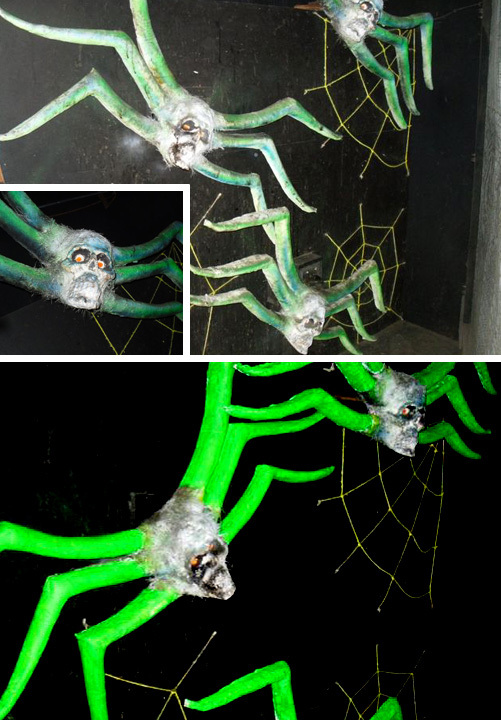 The Skull Spiders were refurbished by Randy Skalos in the spring of 2010. Just as riders think they have escaped Tracy’s bizarre world, they are faced with a non-original stunt purchased from Elusive Concepts in the mid 1990s. Formerly in this space was a large organ that changed colors and was popular during the late 60s era. In time, the organ was vandalized and removed from the attraction. HONK! Immediately before briefly exiting the ride, riders experience a loud air horn and bright light that occur simultaneously. The air horn was added to the attraction in the 1980s and is not a Tracy original. As one of the more memorable experiences of the attraction, riders exit and take a dip while looking out into the loading area. Originally, the dip was much lower and caused whiplash for riders as often times the car would not run the full dip and jerk to a stop. The ride attendant would have to push-assist several cars throughout the evenings which prompted an alteration by the management in the early 1980s making the dip less intense, as Perry Duncan remembers. When the ride was first opened, there were a series of three sound bytes that would play in the loading area right before riders would come outside announcing their pending arrival. One of the sounds was that of a series of horses galloping. The park eliminated the sounds in the early 1980s.